Longmont, Colorado – Mountain Secure Systems (MSS), announced today that it has been awarded a two-year development and production contract from DRS Technologies, Inc. to provide ruggedized video management units (VMUs). The rugged VMU from MSS is a 3U VPX system comprised of several single board computers, high definition (HD) frame grabber cards, graphical processor units, and other I/O modules. It will provide computing resources for the primary Operator’s Control Station (OCS) on the Surveillance and Battlefield Reconnaissance Equipment (SABRE) system from DRS Technologies, Inc. The SABRE system from DRS is a highly modular sensor suite that integrates radar, thermal imaging, and laser systems on a stabilized mast and is compatible with any type of battle command network. It provides scouts, forward observers, and tactical air controllers with the ability to perform reconnaissance and targeting at extended ranges. The system facilitates operations while hidden or on the move in rugged environments, share targeting data from multiple sensors across battle command networks. The SABRE system was updated to accommodate the Canadian Army Light Armored Vehicle (LAV) Surveillance Program. MSS also offers in-flight entertainment (IFE) solutions for the commercial aircraft market, as well as legacy interface conversion solutions for customers in the aerospace and defense industries. In addition, MSS provides outdoor wireless network solutions for video, voice and data applications. Also, MSS provides outdoor wireless network solutions for video, voice, and data applications. Longmont, Colorado – Mountain Secure Systems (MSS), announced today that it has recently shipped an order of removable, ruggedized solid state drives (SSDs) to a leading defense contractor, which will be integrated into a pod system for the MQ-9 Reaper Drone. The MQ-9 drone is utilized by the U.S. military to monitor U.S. borders and gather video surveillance intelligence. The removable 2.5” SATA memory devices mate with a customized docking bay and are environmentally sealed for protection against rapid decompression, EMI, humidity, dust, salt fog, immersion and condensation. The hot swappable device includes mini mil-circular connectors (rated for 100,000 insertion cycles), +28VDC power, EMI filters, and captive thumb screws for docking. Longmont, Colorado – Mountain Secure Systems (MSS), announced today that it has been selected to provide ruggedized, bolt-on USB data storage devices for the new Autonomous Mining Truck by Caterpillar. “With the emergence of autonomous trucks, we are excited to work with Caterpillar on a reliable solution to record activity and vital characteristics of operation,” said Ken Dickson, general manager of Mountain Secure Systems. 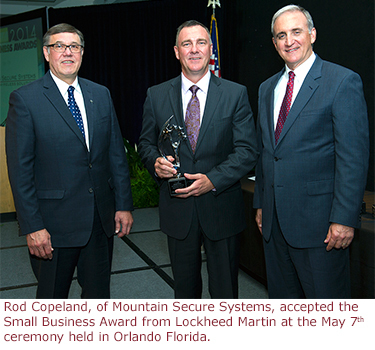 Longmont, Colorado – Mountain Secure Systems (MSS), announced today that it received a 2013 Outstanding Small Business Award from Lockheed Martin Missiles and Fire Control on May 7, 2014 at a ceremony held in Orlando, FL. Each year, Lockheed Martin businesses nominate and select small companies that have consistently provided outstanding support and products during the past year. Though the corporation has thousands of suppliers, only a few small businesses are recognized for their outstanding quality in goods and services. “Lockheed Martin’s small business suppliers are critical to helping manufacture products that support customer missions around the world,” said Pat Sunderlin, vice president of global supply chain at Lockheed Martin Missiles and Fire Control. Mountain Secure Systems has been recognized before by Lockheed Martin Missiles and Fire Control for its outstanding support. MSS supplies ruggedized digital data recorders (DDRs) to Lockheed Martin’s Sniper Advanced Targeting Pod (ATP) program. Longmont, Colorado – Mountain Secure Systems (MSS), a leading supplier of rugged electronics and outdoor wireless network solutions, announced today that it shipped four 900 MHz Summit™ Series wireless network products to Great Plains Television Network, LLC. The wireless network products will be used to deliver a total of six different live television networks to a transmitter located 14 miles away. Made in the USA, Summit wireless network products provide coverage for point-to-point, point-to-multipoint and wireless mesh networks in the 900MHz, 2.4 and 5.8 GHz unlicensed frequency bands, as well as the licensed 4.9 GHz public safety band. Product options include FIPS 140-2 validation, which provides highly secure, end-to-end encryption, as well as 802.11n MIMO technology, which offers connection speeds up to 150 Mbps. Summit’s intuitive software makes it easy to install, configure and manage an entire network from any location with Internet access. In addition, Summit wireless solutions come with an industry-leading two-year warranty, as well as the flexibility to be configured in numerous manners and/or customized to meet a client’s specific requirements. Longmont, Colorado – Mountain Secure Systems (MSS), a leading supplier of rugged electronic solutions to the aerospace and defense industries, announced today that it has launched a cost-effective, ruggedized drop-in conversion sled that converts Fibre Channel or SCSI interfaces to SATA in a standard 3.5” form factor. The conversion sled mimics a 3.5” Fibre Channel or SCSI (50, 68 and 80-pin) hard drive (HD) or solid state drive (SSD) by integrating a standard, commercially-available 2.5” SATA HD or SSD into a 3.5” standard form factor package. This convenient solution reduces the effort of locating replacement end-of-life (EOL) drives, which may or may not be available, and helps avoid the high cost of redesigning and re-qualifying system architecture to utilize modern interfaces. Customers can select virtually any drive to best meet their requirements, based on a number of considerations like price, capacity, HD vs. SSD, speed, environment, endurance, and single-level cell (SLC) vs. multi-level cell (MLC). Customers also have the option to customize firmware to meet their specific application. MSS conversion sleds incorporate an electrical barrier that prevents anything from shorting against the printed circuit board assembly (PCBA) or HD/SSD. PCBAs are conformal coated to withstand moisture, sand, dust, etc. And, most importantly, all MSS conversion sleds are designed and manufactured to meet AS9100 configuration control standards and are fully-functional tested to the customer’s environmental requirements prior to delivery. Longmont, Colorado – Mountain Secure Systems (MSS), a SDVOSB and leading supplier of rugged electronic solutions to the defense industry, announced today that it received a STAR Supplier Program Award from Lockheed Martin. “The Lockheed Martin STAR Supplier Program was implemented to support our philosophy of building a world class supply chain that demonstrates excellence as their standard and continuous improvement as their culture,” said Michael O. Gordon, vice president of operations at Lockheed Martin. Lockheed Martin STAR Supplier Awards are given based on a number of performance criteria, including product quality, punctual delivery and cost competitiveness. STAR suppliers receive increased access to new business opportunities, and a heightened awareness of suppliers’ capabilities and performance history. Last month, Mountain Secure Systems was selected to the Lockheed Martin Missiles and Fire Control Preferred Supplier Program for its commitment to quality. Longmont, Colorado – Mountain Secure Systems (MSS), a SDVOSB and leading supplier of rugged electronic solutions to the defense industry, announced today that it received Preferred Supplier Program (PSP) status from Lockheed Martin Missiles and Fire Control (LMMFC). As a Lockheed Martin Missiles and Fire Control 2010 Small Business of the Year Award recipient, Mountain Secure Systems was recently selected to provide upgraded digital data recorders (DDRs) to Lockheed Martin for its Sniper Advanced Targeting Pod (ATP). Longmont, Colorado – Mountain Secure Systems (MSS), a leading supplier of rugged electronics and outdoor wireless network solutions for commercial, military and municipal applications, announced today that it will provide additional 900 MHz Summit™ Series wireless network radios to the Denver Public Works Traffic Engineering Services to further expand coverage for its state-of-the-art traffic control system. Made in the USA, Summit radios provide coverage for point-to-point, point-to-multipoint and wireless mesh networks in the 2.4 and 5.8 GHz unlicensed frequency bands, as well as the licensed 4.9 GHz public safety band. Product options include FIPS 140-2 validation, which provides highly secure, end-to-end encryption, as well as 802.11n MIMO technology, which offers connection speeds up to 150 Mbps. Summit’s intuitive software makes it easy to install, configure and manage an entire network from any location with Internet access. In addition, Summit radios come with an industry-leading two-year warranty, as well as the flexibility to be configured in numerous manners and/or customized to meet a client’s specific requirements. MSS is also a proud provider of wireless network radios to the Chicago Police Department, which operates one of the largest dedicated broadband wireless video surveillance networks in the United States. Longmont, Colorado – Mountain Secure Systems (MSS), a SDVOSB and leading supplier of rugged electronic solutions to the defense industry, announced today that it will provide upgraded digital data recorders (DDRs) to Lockheed Martin [NYSE:LMT] for its Sniper Advanced Targeting Pod (ATP). According to Lockheed Martin, the Sniper ATP is the most widely deployed targeting system for fixed-wing aircraft in use by the U.S. Air Force, and is the targeting system of choice for 14 international air forces. Having provided the previous two generations of DDRs to the Sniper pod, MSS incorporated numerous upgrades and customizations to meet Lockheed Martin’s program requirements on the new DDR, which adheres to all MIL-STD-810F standards. Features of the new DDR include unit removability, custom connectors, tool-less handles, pre-set secure erase functions and sealed enclosures to protect it from environmental elements like salt, fog, dust, humidity and fungus. The new DDRs, part of a multi-million dollar contract, will be delivered to Lockheed in several installments in late 2012 and early 2013. In addition to packaging solid state drives (SSDs), MSS, offers ruggedized solutions for traditional hard drives, subsystem integration and commercial aircraft in-flight entertainment (IFE) systems. MSS also provides a wide range of outdoor wireless network solutions for video, voice and data applications. Longmont, Colorado – Mountain Secure Systems (MSS), a service-disabled, veteran-owned small business (SDVOSB) and leading supplier of rugged electronics and outdoor wireless network solutions to commercial, military and municipal industries, announced today that it will provide additional Summit™ Series wireless network radios to the City of Denver's Public Works Traffic Operations. The new orders call for 35 new Summit Series radios to expand coverage for a video surveillance network, aimed at improving traffic control at various intersections throughout the city. Last December, MSS provided 50 Summit Series wireless network radios for this very same video surveillance system. Made in the USA, Summit radios provide coverage for point-to-point, point-to-multipoint and wireless mesh networks in the 2.4 and 5.8 GHz unlicensed frequency bands, as well as the licensed 4.9 GHz public safety band. Product options include FIPS 140-2 validation, which provides highly secure, end-to-end encryption, as well as 802.11n MIMO technology, which offers connection speeds up to 150 Mbps. The Summit's rugged hardware is built to outlast the harshest environments, which is perfect for virtually any outdoor video, voice or data application. Summit's intuitive software makes it easy to install, configure and manage an entire network from any location with Internet access. In addition, Summit radios come with an industry-leading two-year warranty, as well as the flexibility to be configured in numerous manners and/or customized to meet a client's specific requirements. "Mountain Secure Systems is proud to continue doing business with the City of Denver," said Ken Dickson, General Manager of Mountain Secure Systems. "Our Summit Series wireless network radios simplify the process of expanding coverage for video surveillance networks." MSS is also a proud provider of wireless network radios to the Chicago Police Department, which operates one of the largest dedicated broadband wireless video surveillance networks in the United States. To date, over 1,100 MSS wireless network radios have been deployed for the Chicago PD. Longmont, Colorado – Mountain Secure Systems (MSS), a service-disabled, veteran-owned small business (SDVOSB) and leading supplier of rugged electronics and outdoor wireless network solutions to commercial, military and municipal industries, announced today that it will provide 50 new Summit Series wireless network radios to the City of Denver's Public Works Traffic Operations. The Summit radios were purchased to support a new video surveillance network, aimed at improving traffic control at various intersections throughout the city. "Our Summit Wireless Network Radios are designed to deliver the best cost-to-performance ratio in the wireless network industry," said Ken Dickson, General Manager of Mountain Secure Systems. "We are honored to support the City of Denver with this important initiative." Longmont, Colorado – Mountain Secure Systems (MSS), a service-disabled, veteran-owned small business (SDVOSB) and leading supplier of rugged electronics and wireless network solutions to the defense industry, announced today that it will unveil its new Summit Series wireless network products at ISC West. Summit products are designed to deliver the best cost-to-performance ratio in the wireless network industry. Product options include FIPS 140-2 validation, which provides highly secure, end-to-end encryption, as well as 802.11n MIMO technology, which offers connection speeds up to 150 Mbps. Made in the USA, Summit radios provide coverage for point-to-point, point-to-multipoint and wireless mesh networks in the 2.4 and 5.8 GHz unlicensed frequency bands, as well as the licensed 4.9 GHz public safety band. The Summit's rugged hardware is built to outlast the harshest environments, which is perfect for virtually any outdoor video, voice or data application. Summit's intuitive software makes it easy to install, configure and manage an entire network from any location with Internet access. Like all wireless network radios from MSS, Summit radios come with an industry-leading two-year warranty, as well as the flexibility to be configured in numerous manners and/or customized to meet a client's specific requirements. The National Guard recently deployed Summit radios for a wireless video surveillance network in the state of Georgia. MSS also has wireless network radios deployed in remote areas of Iraq and Afghanistan for the US military, delivering mission-critical communications for our troops. "No other wireless network solutions provider can match Mountain Secure Systems' stringent manufacturing processes, which adhere to guidelines set by America's armed forces," said Ken Dickson, General Manager of Mountain Secure Systems. "Our FIPS 140-2 validated product was designed and constructed with our military and federal government customers in mind." ISC West takes place April 6-8, 2011 at the Sands Expo & Convention Center in Las Vegas, NV. MSS will be exhibiting in booth 9135. To learn more about ISC West, visit www.iscwest.com. Mountain Secure Systems Further Expands Largest Wireless Video Surveillance System in U.S.
Longmont, Colorado – Mountain Secure Systems, a leading provider of ruggedized electronics and wireless network solutions, shipped additional SpeedLAN 9200 outdoor wireless routers this month to Avrio RMS Group, who will use them to expand coverage for the Chicago Police Department's video surveillance system in the 4.9 GHz public safety band. Chicago PD's video surveillance system is the largest dedicated broadband wireless video surveillance network in the United States. To date, Mountain Secure Systems has provided Avrio RMS Group with over 1,100 SpeedLAN wireless routers for the Chicago PD video surveillance system. The SpeedLAN 9200 wireless router, which is the exclusive wireless router used by the Chicago PD, comes with an industry-leading two-year warranty and offers coverage for point-to-point, point-to-multipoint and wireless mesh networks for high-speed data, video and voice (VoIP) applications. Built in a world-class manufacturing facility in the United States (Longmont, Colorado), the SpeedLAN wireless router combines high performance, a broad feature set and hardware-based AES encryption, allowing systems integrators to deliver solutions that are secure, customizable, scalable and adaptive. "Our SpeedLAN wireless routers have been in operation for over five years for the Chicago Police Department," said Ken Dickson, General Manager of Mountain Secure Systems. "They have stood up against some of the worst weather imaginable, yet they continue to be extremely reliable." Longmont, Colorado 10/25/2010 – Mountain Secure Systems, a leading provider of ruggedized electronics and wireless network solutions, shipped 25 SpeedLAN 9200 tri-band wireless routers this month to Avrio RMS Group, who will use them to expand coverage for the Chicago Police Department's state-of-the-art video surveillance system, which is the largest of its kind in the United States. To date, Mountain Secure Systems has provided Avrio RMS Group with over 1,000 SpeedLAN wireless routers for the Chicago PD video surveillance system. The SpeedLAN 9200 wireless router from Mountain Secure Systems comes with an industry-leading two-year warranty and offers coverage for point-to-point, point-to-multipoint and wireless mesh networks for high-speed data, video and voice (VoIP) applications. It combines high performance, a broad feature set and hardware-based AES encryption, allowing systems integrators to deliver wireless solutions that are secure, flexible, scalable and adaptive. "We value our strong working relationship with the knowledgeable professionals at Avrio RMS," said Ken Dickson, General Manager of Mountain Secure Systems. "We're also proud that our wireless network technology helps support key initiatives like fighting crime for a world-class city like Chicago." Longmont, Colorado – Mountain Secure Systems (MSS), a leading supplier of rugged electronics to the aerospace and defense industries, announced the successful completion of a high-speed, Ethernet-based data recorder for a major prime contractor, which will be utilized in a new mobile missile defense system. The rugged unit, which includes a liquid-cooled chassis with removable solid state disks, was customized to meet the customer's interface, performance, size, weight, power and environmental specifications. Over the past 12 months, MSS has supplied a variety of custom and off-the-shelf solid state memory solutions to the air defense, missile and fire control markets. MSS's expertise in the ruggedization of sealed, rotating hard drives (SRHDs) has allowed them to penetrate new market segments that need rugged packaging of electronics that meet MIL-STD-810F specifications. "We are excited about expanding into new military markets, especially where our core competencies create value for our customers," said Ken Dickson, General Manager of Mountain Secure Systems. "Our strengths in rugged design, manufacturing and testing have made this a rather seamless transition." MSS will be showcasing its rugged electronics at the International Telemetering Conference (ITC) October 25-28, 2010 in San Diego, CA. MSS will be exhibiting in booths 518 and 520. To learn more about ITC, visit http://www.telemetry.org. Longmont, Colorado 8/8/2010 – As world-renown ruggedization specialists, MSS provides cost-effective IFE solutions and contract manufacturing services that meet DO-160 specifications. MSS ruggedizes a variety of custom and standard sealed hard disk drives, solid state drives, rack-mounted chassis, data and memory storage systems, data recorders and loaders. "Mountain Secure Systems delivers DO-160 qualified hard disk drives at very low cost per gigabyte," said Ken Dickson, General Manager of Mountain Secure Systems. "All our rugged IFE products are manufactured in a world-class ISO 9001:2000- and AS9100C-certified facility that meets rigid quality management standards for aerospace and defense applications." MSS is also a leading provider of fast, secure wireless network solutions for video, voice and data applications. Mountain Secure Sysems (MSS), a leading supplier of rugged electronics to the aerospace and defense industries, will unveil its expanded capabilities to deliver ruggedized, box-level embedded electronics at AUVSI 2010, the world's largest unmanned systems exhibition. MSS provides a wide variety of custom and standard hard disk drives, rack-mounted chassis, data and memory storage systems, solid state drives and data recorders. "All box-level electronics and line-replaceable units (LRUs) are desgned, built and tested to the same rigid standars as our world-reknowned rugged data storage products," said Ken Dickson, General Manager of Mountain Secure Systems. "We look forward to exhibiting at AUVSI and communicating with key leaders in the unmanned systems marketplace." Las Vegas, Nevada – Mountain Secure Systems, a leading provider of ruggedized electronics and wireless networking solutions to military, aerospace and commercial markets, unveiled today its new SpeedLAN 9300 Dual Wireless Router and SpeedLAN 9400 M-Series MIMO (multiple-input multiple-output) 2X Wireless Bridge/Router at ISC West (International Security Conference & Exposition) as part of three in-booth demonstrations. The SpeedLAN 9300 Dual Wireless Router provides a robust, self-healing wireless mesh, point-to point or point to multipoint network for high-speed data, video and voice (VoIP) applications. Operating in the unlicensed 2.4GHz and 5 GHz bands, as well as the licensed 4.9 GHz public safety band, the SpeedLAN 9300 Dual Wireless Router combines high performance, a broad feature set, and hardware-based AES encryption to provide secure, flexible, scalable, and adaptive wireless mesh and non-mesh network solutions. Having back-to-back wireless routers, connected together by wired Ethernet cables, creates powerful wireless repeaters for high-bandwidth applications. Each router may also be used independently on different RF bands or channels. As a result, the versatile SpeedLAN 9300 Dual Wireless Router is perfect for complex, long-distance point-to-point, point-to-multipoint and wireless mesh networks. The SpeedLAN 9400 M–Series MIMO 2X Wireless Bridge/Router provides a robust, point-to-point or point-to-multipoint network for high-speed data, video and voice (VoIP) applications. With speeds up to 300Mbps, and operating in the unlicensed 2.4GHz and 5 GHz bands, the SpeedLAN 9400 M–Series MIMO 2X Wireless Bridge/Router combines high performance, a broad feature set, and hardware-based AES encryption to provide secure, flexible and scalable network solutions. It is perfect for extremely high bandwidth applications, such as backhauls and mega-pixel video stream transmissions. Longmont, Colorado – Mountain Secure Systems, a leading provider of ruggedized electronics and wireless networking solutions to military, aerospace and commercial markets, announced today that it will unveil its new SpeedLAN wireless dual radio and SpeedLAN wireless MIMO (multiple input multiple output) radio at ISC West (International Security Conference & Exposition) as part of three in-booth demonstrations. The SpeedLAN dual radio contains two wireless routers in a single chassis, and the SpeedLAN MIMO radio uses multiple antennas to improve network throughput. The first in-booth demo will display a high-definition (HD) movie being distributed from a laptop computer, through a wireless point-to-point network that includes two SpeedLAN MIMO radios, to another laptop computer, without losing picture quality. The second in-booth demo will showcase Mountain Secure Systems' SPEEDManage software, which makes it easy to monitor and configure an entire network from any location with a web interface. The demo will include a laptop computer that communicates with two SpeedLAN single radios and a SpeedLAN dual radio over a wireless mesh network. The third in-booth demo will be a live Internet broadcast. The demo will include an AirPro Gold II indoor wireless router and SpeedLAN M-Series outdoor wireless bridge from Mountain Secure Systems, along with a Sony HD video camera, an Ethernet switch, a laptop computer and a 37-inch VIZIO flat-screen HD television. The computer and television will project live images sent from the video camera, which will be connected to the Ethernet switch. The Ethernet switch will deliver the video signal to the AirPro Gold II indoor router, which will transmit the signal to the SpeedLAN M-Series outdoor bridge. The SpeedLAN M-Series outdoor bridge will be connected to the Internet at MountainSecureSystems.com. As a result, people who visit the Mountain Secure Systems exhibit can choose to broadcast themselves on the company's web site via the live video feed. "Mountain Secure Systems is committed to providing the most reliable and affordable wireless networking solutions for the security market," said Ken Dickson, General Manager of Mountain Secure Systems. "We are excited about the opportunity to unveil our new wireless dual radio and MIMO radios on a grand stage like ISC West." SpeedLAN wireless solutions are currently deployed for the Chicago Police Department in one of the largest video surveillance systems in the United States, as well as remote locations in Iraq and Afghanistan to ensure the delivery of vital communications for the U.S. military. All wireless solutions from Mountain Secure Systems come with an industry-leading two-year warranty and are built in a world-class manufacturing facility that meets stringent quality management standards for aerospace and defense applications.